At the crippled Fukushima nuclear power plant in Japan, scientists are running out of space for the plant’s enormous amounts of irradiated water. The radioactive water is being stored in thousands of tanks, and contains tritium, a substance that is hazardous to health. About 300 tons need to be pumped into the plant every day to keep its reactors cool. Tritium can be removed from water in laboratories, but such an effort would be preposterously expensive, so scientists have another idea in mind: dumping the nuclear waste into the ocean. More important than the fish supply is the potential toll a release of tritium could have on human health. The substance goes directly into the soft tissues and organs of the body, potentially increasing the risk of cancer and other illnesses. The Japanese government has been trying to downplay the risk to the public. 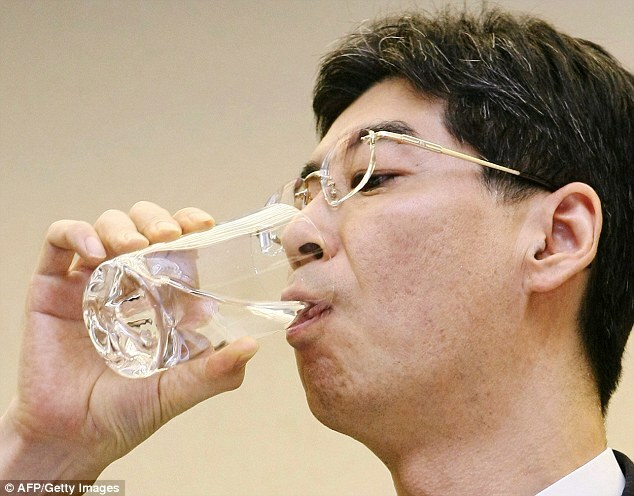 Japan’s Parliamentary Secretary even sipped from a glass of decontaminated water taken from puddles inside the buildings housing reactors 5 and 6 in front of news cameras. Children are particularly at risk. Rosa Yang, a nuclear expert at the Electric Power Research Institute, based in Palo Alto, California, isn’t worried. She says the amount of tritium that would be released into the water would amount to just 57 ml – about the amount of liquid in a couple of espresso cups. According to Yang, that amount would be barely a drop in a bucket compared to the size of the oceans. Shunichi Tanaka, chairman of the Japanese Nuclear Regulation Authority, those couple of espresso cups-worth of tritium would be well below the global standard allowed for the substance in water. But the reassurances aren’t likely to calm the nerves of locals. There is so much distrust that Tokyo Electric Power Co. (TEPCO), the utility that operates Fukushima and oversees its decommissioning, has had little to say about the tritium. It is believed that the company is waiting for a decision from the Japanese government. In 2011, Fukushima was irreparably damaged when a 50-foot tsunami slammed into it following a 9.0 magnitude earthquake. It was the worst nuclear disaster since Chernobyl in 1986. The 2 are the only disasters ever to be given the most severe grade, 7, by International Nuclear and Radiological Event Scale (INES). Japan, as a nation, you screwed up. Just admit it. Unfortunately, the rest of us around the world are now having to deal with the consequence of your placing a nuclear reactor in an area noted for earthquakes AND failing to plan for the event of a Tsunami, which earthquakes trigger. Yes, it was a simple oversight that, most unfortunately, had far reaching and catastrophic consequences. When I visited Japan, many years ago, I was somewhat taken aback by the arrogance of some of the folks I met who considered me intellectually inferior, because I was American. Being Japanese does not make one automatically superior. So Desu! I trust that polluting the entire Pacific Ocean has been a humbling experience. Don’t make it worse. If they have been keeping radioactive water stored in thousands of tanks, and contains tritium, a substance that is hazardous to health. About 300 tons need to be pumped into the plant every day why now do they think its safe to pump it into the ocean? This sounds like disaster to me. Expert: “And we’re not just talking marine die-offs… yeah, it’s a really big deal” — “There are many more species that are getting sick” — “Facing possibility of extinction” Biologists are calling the mass death of west coast sea stars the worst wildlife die-off ever recorded.